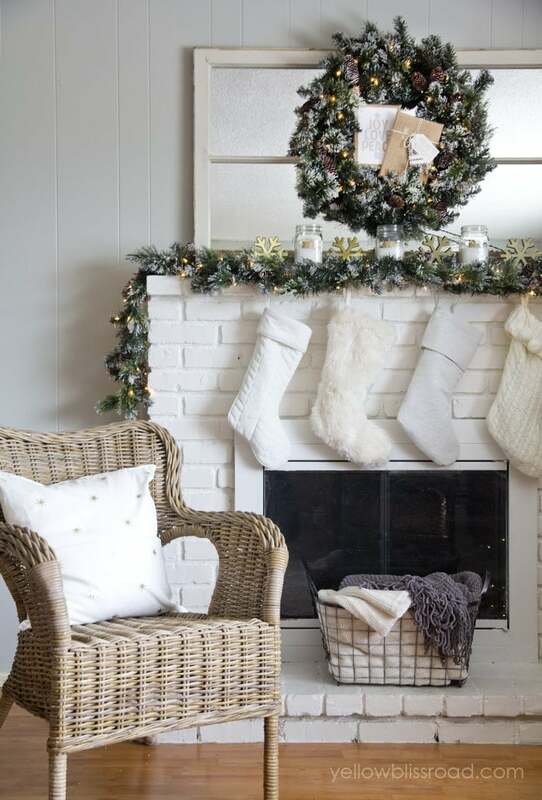 I have partnered with Martha Stewart Living Omnimedia, Inc. for this holiday program. All expressed opinions and experiences are my own. 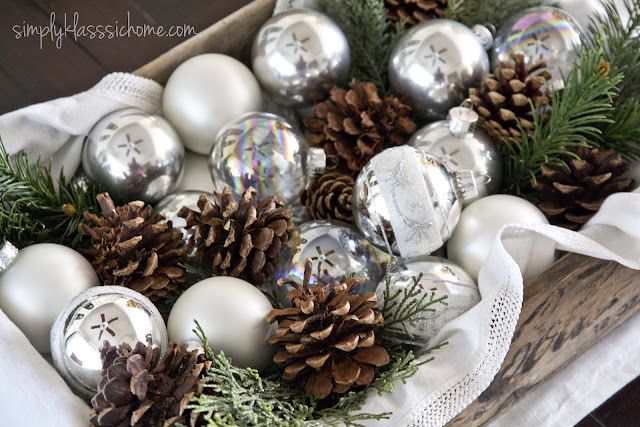 I am so, so excited to share a little of my Rustic Glam Christmas decor with you today!! I have been working on this little area of my home for the past week and I am in love with how it turned out. 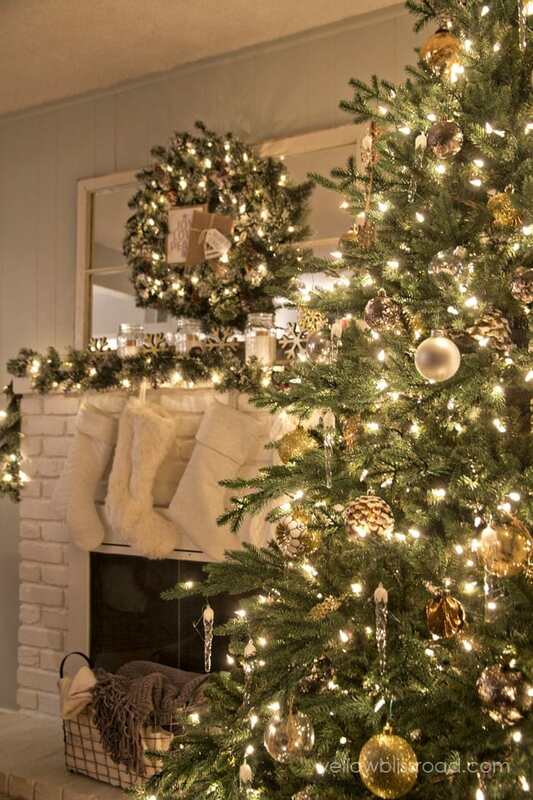 I received this GORGEOUS 7.5′ Royal Spruce Artificial Tree from Martha Stewart Living at The Home Depot. I wasn’t specifically asked to review it, but I’m going to because I really, really love it. From the moment we took it out of the boxes (yup, two boxes) I could tell it was going to be beautiful. It comes in four pieces (all other artificial trees I’ve had have only been in three pieces) and it’s pre-lit with the wiring right in the trunk. So all you have to do is snap the tree pieces together and your tree it lit. No hunting for cords to plug together! Pretty cool, right? I love how REAL it looks. We can’t have a “real” tree because of my son’s allergies, and really, I like having an artificial tree. Easier to set up and clean up, and no big messy piles of pine needles all over the place. I don’t usually go crazy with how I decorate my tree, and my kids will be adding their own ornaments later, but I wanted to just enjoy this beautiful sparkly look for a while. I used the gold and copper shatter resistant ornaments from the Martha Stewart Living Snowberry Line. They come in three sizes: five inch (8 pack), three inch (75 pack) and two inch (101 pack). 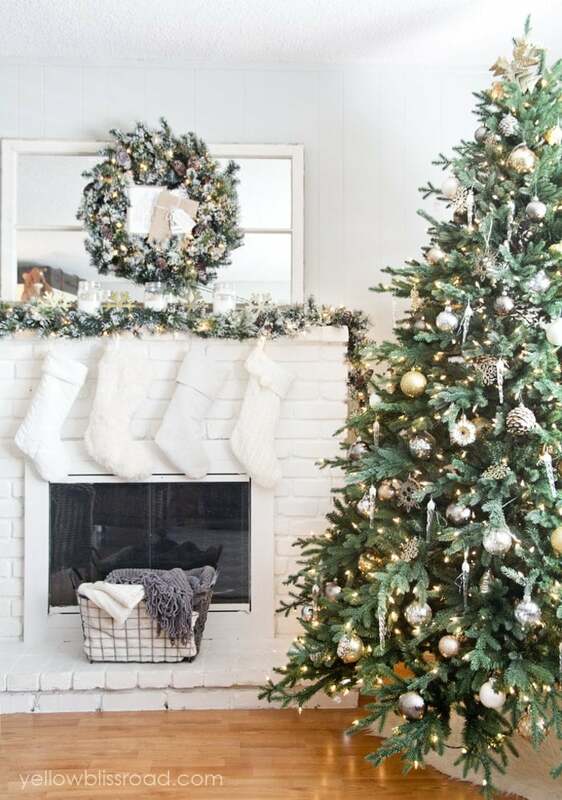 I saved the red to use in other places in my home since I was really loving the metallic on the tree and mantel. I also included some glass icicle ornaments that I found in my stash, as well as a bunch of my favorite mercury glass ornaments that I’ve collected over the years. Around the base of the tree I wrapped a simple faux fur rug (about $10 at IKEA). It looks amazing at night, and the photos don’t really do it justice. Our kitty seems to really enjoy basking in it’s glow as well. 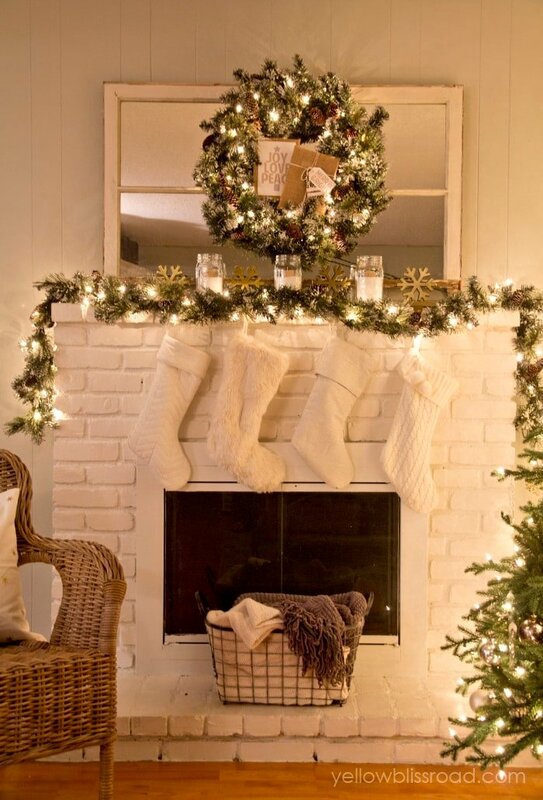 The mantel is always my favorite, and this year is no exception. I attached a pre-lit Sparkling Pine Artificial Wreath to my mirror, and matching Pre-Lit Sparkling PineArtificial garland to my mantel top. I’ve got more of it in my dining room, but you’ll have to wait until next week to see that! 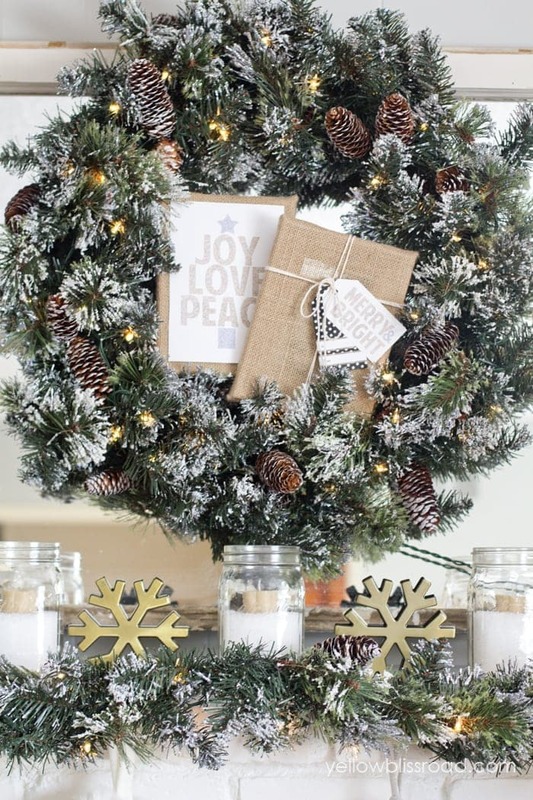 The glittery “snow” and pinecones give a beautifully rustic feel. Epsom salt is a staple in my Christmas decorating every year, as you can see in my Non-Traditional Advent Candles from a couple of years ago. This year I filled large, wide-mouthed Ball jars with the salt about 2/3 full. I added small votive candles (don’t worry, I don’t plan on lighting them – they’re just for looks). The signs and gift tags shown in the wreath are free printables that you can find HERE. 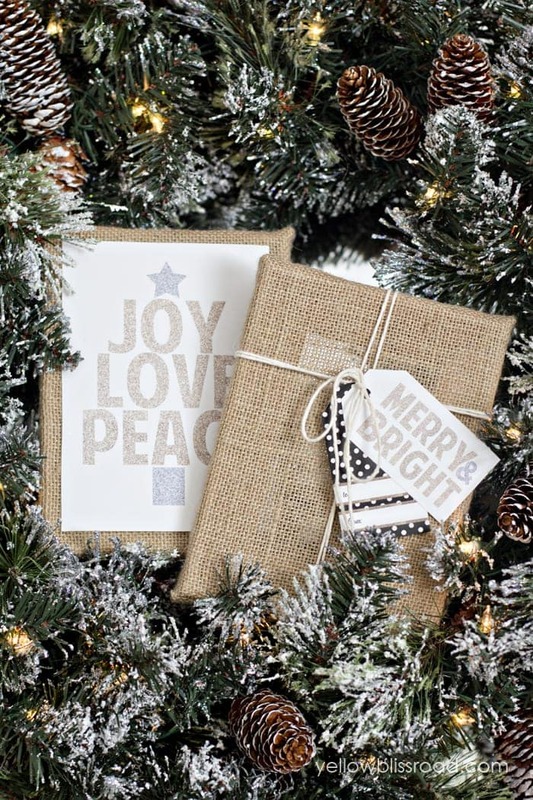 There are six tags in all, plus the glittery sign that you can download in 8×10″ or 5×7″ sizes. 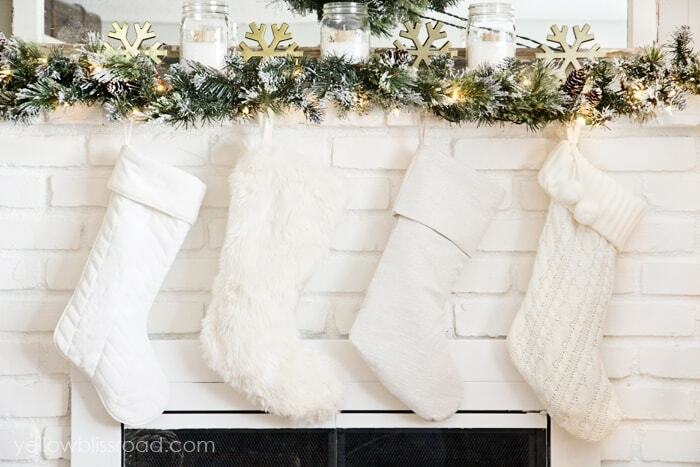 I went a little different with my stockings this year and I really like the different textures. Plus it makes it really easy for each person to choose which is theirs. 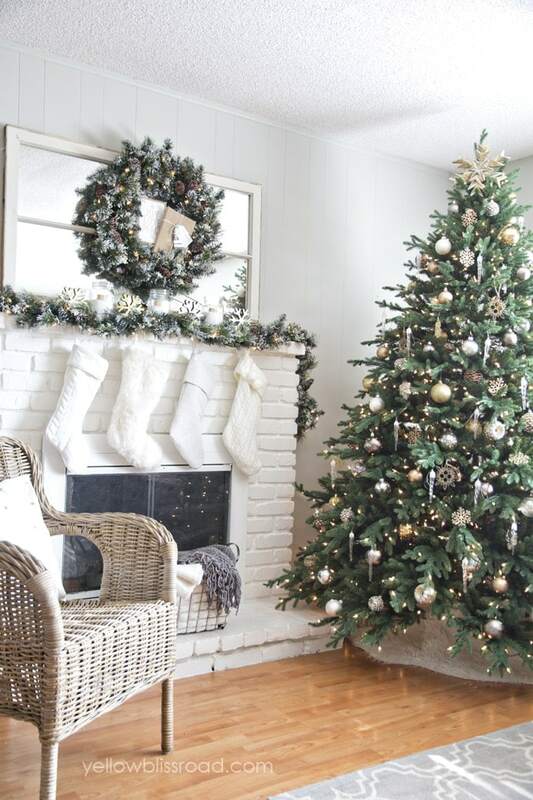 I am super thrilled with how my tree and mantel look, and I don’t care if my neighbors think I’m crazy for decorating for Christmas in November. 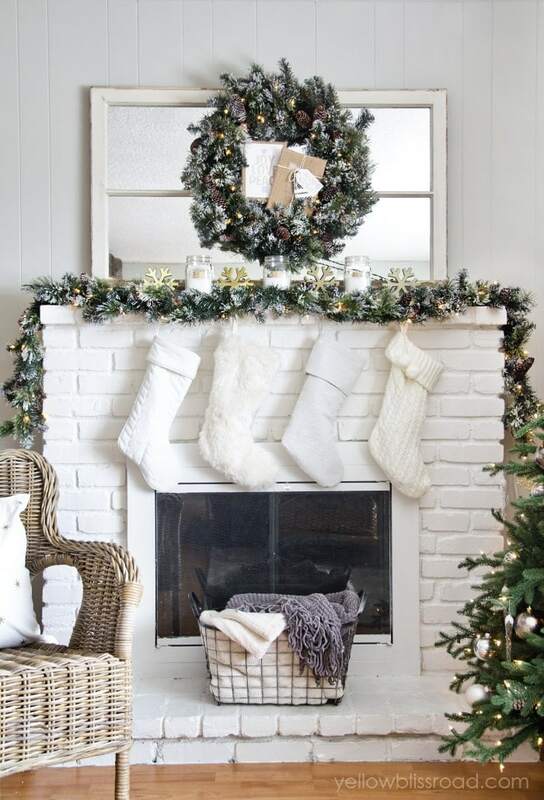 See more Martha Stewart Living Christmas decor at Home Depot. For all things CHRISTMAS, go HERE. I love the tablecloth on your Christmas dining room table. It looks like it’s linen/beige with gold specs in it. Would you share where you purchased it? I love your decorating. It’s very beautiful! It’s from Target. It’s actually not linen, I think it’s just polyester, but it does have some gold and silver metallic running through it. Bought it last year (2014) so not sure if you can still find it. We really like your pictures and would like to use one for a project. Obviously, we need your okay to use it, so if you could get back to us ASAP that would be great! Thanks. Your Christmas Glam turned out just Perfect! Thanks for sharing your amazing talent with us. : ) Where did you get your grey area rug ? Thanks so much Holly! The rug is from Pottery Barn. Hi Kristin. I love ALL of your decor. I too love to decorate with simple things I have at home. 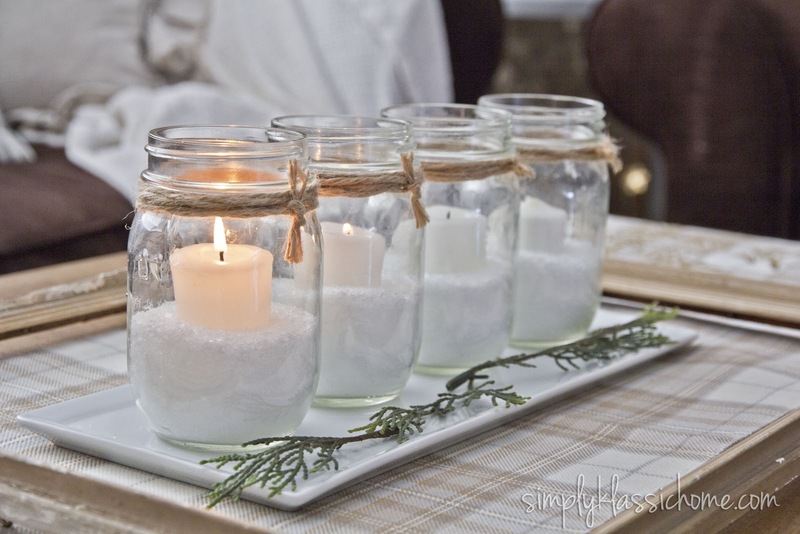 I will this year do the same decor with the mason jar idea and twist it a little. 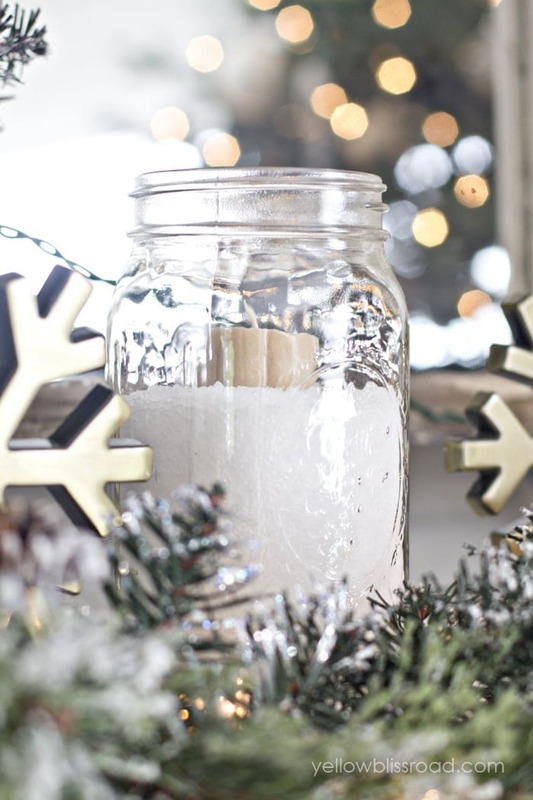 I take your salt idea add it to an old sugar jar with lid and make a snowy scene with small Christmas tree and reindeer near by. Thank you for your inspiring ideas. Keep em’ coming!!! I love this darling printable and tags but every time I click on the link to download, it takes me to an external site/ad. What am I doing wrong? I tried several of your links and the same thing happened? Thank you so much, and happy holidays! 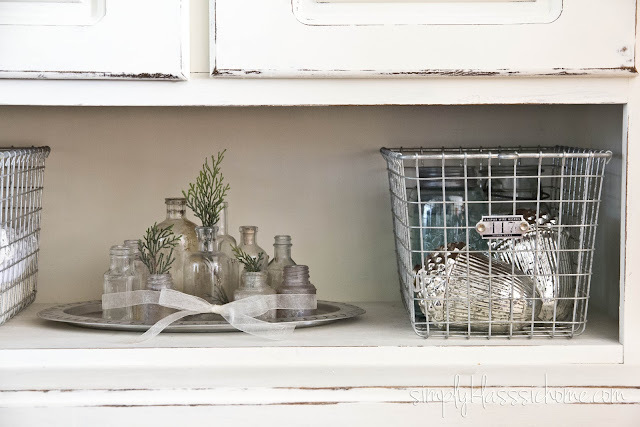 I love every detail Kristin! 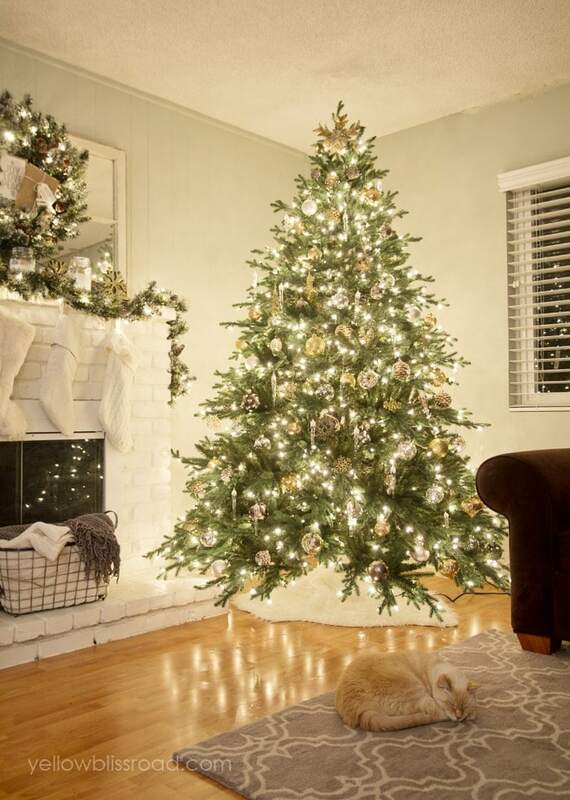 I was totally going to wrap my tree with white faux fur too…yours looks fantastic and your tree looks amazing! I love your tree and all your decorations. They are perfect! Hi Kristin! 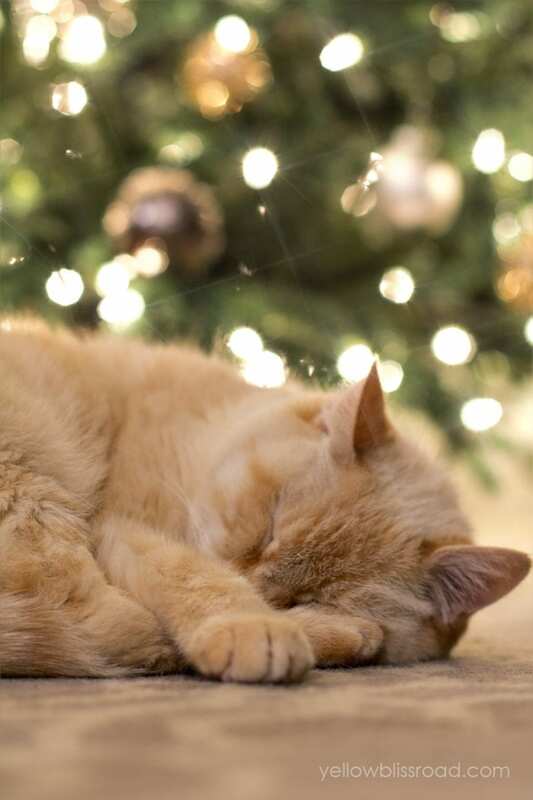 I love your holiday decor; it’s beautiful! 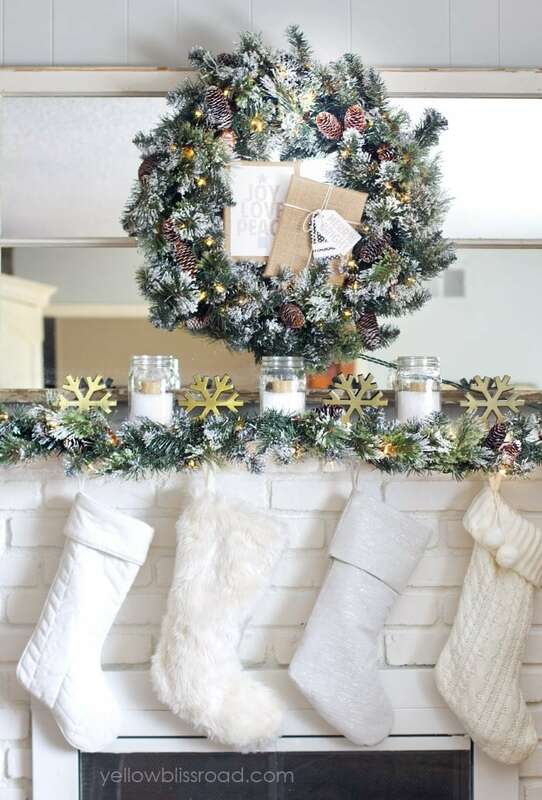 I was curious to see if you’d share where you found the stockings? Thanks! They all came from Target!